Two years ago I was sitting on the couch holding Addie’s hand when I felt a big rough spot on her little Addie hands. “The monkey bars.” had she known how to roll her eyes and properly use the term “Duh, mom.” she would have. Addie moved up another level in gymnastics last week, which means her regular class is now a half hour longer and she attends an ‘intense gymnastic training’ class on Saturdays. Ten minutes into her Saturday workout I texted Cody and told him if I were doing what she was doing I’d be dead. The kid is crazy strong. I’m crazy proud of her and I love watching her. Seeing her learn such control over her body without even realizing how strong she’s becoming, makes me happy. She decided to share with you a little essay about calluses, since she’s had them for the last two years. Again, this is exactly how she wrote it. I only helped her with spelling or grammar when asked. She’s pretty sure she’ll write about New York next. My post is how you get callouses because I get them all the time from doing the monkey bars. My dad gets callouses and I don’t mind that because callouses can happen when you do the monkey bars to much and I do the monkey bars way to much but that doesn’t stop me from doing the monkey bars. At my school there are a bunch of monkey bars so my family has a monkey bars season when I go to a new school year. The only people who don’t get callouses are my mom and vivi and the only pets who don’t get callouses are wink and percy. The callouses that I get happens almost all the time because I do monkey bars not only at school but I also do the monkey bars in the summer at the park to. It’s fun to do the monkey bars even when I get callouses. One day I’ll show Addie a picture of my feet from when I did ballet. Ain’t no callus like a pointe shoe callus and a pointe shoe callus don’t stop. Happy Monkey Bar Season y’all. I seriously can’t handle how awesome she is. Roozle has recently fallen in love with the monkey bars at school. She just swings on the first one then lets go. I can’t wait to show her this picture tonight. She will love it. I’m so impressed with her monkey bar strength. My arms have no strength. And yes aint no callus like a pointe shoe callus! Addie: My daughter has callouses too. She would do the monkey bars all day, if I let her. 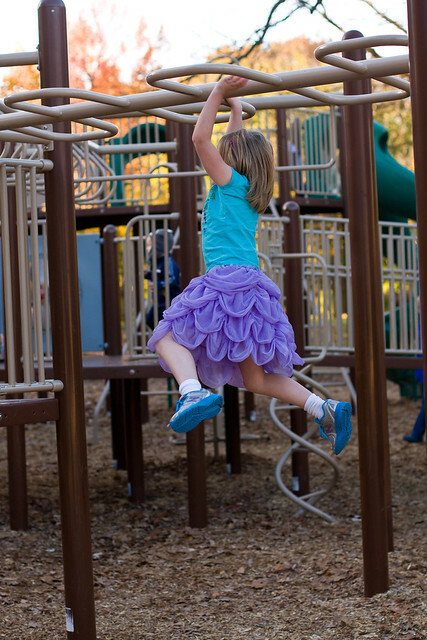 Have fun on the monkey bars! Addie, you are one cool chick. And you have the callouses as proof. My wife at one time and other mentioned she is superior to every person: better than the girl’s relatives, better than the woman life partner, a lot better than additional types, better than your modeling occupation. So say the least, I do not comprehend Louis Vuitton Shoes why anybody continues selecting the woman’s.